I had been craving some good sushi for the better part of a month when one of my best friends recently recommended Sushi Joe. My girlfriends and I decided to all head over to Doral and try the place out. Sushi Joe is a small family run restaurant located in a shopping plaza off of Doral Blvd, the place itself is unassuming and quaint. Inside, amidst dim lighting and Asian decor is a welcoming staff. As me and my glutton girlfriends usually do, we decide to load up on a cornucopia of appetizers before our entrees. 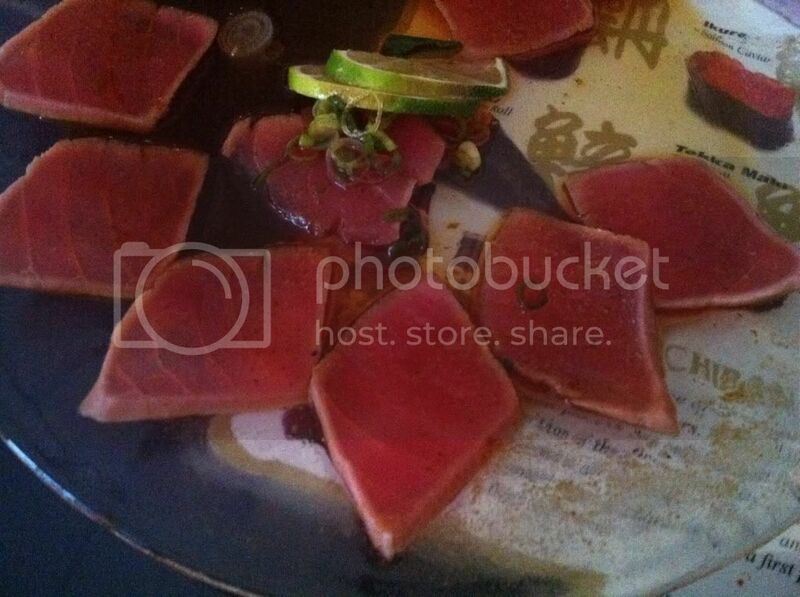 First off, we dig into their Tuna Tataki which was beautifully done, lightly seared and practically melted in our mouths. We had nearly destroyed that plate before I had realized I hadn't snapped a picture of it, but was able to take a picture before it disappeared. It was served over a ginger soy sauce and sprinkled with very thinly sliced scallions that gave it a nice depth of flavor. Definitely a dish to try out. Then we decided to inhale their Pork Gyoza. 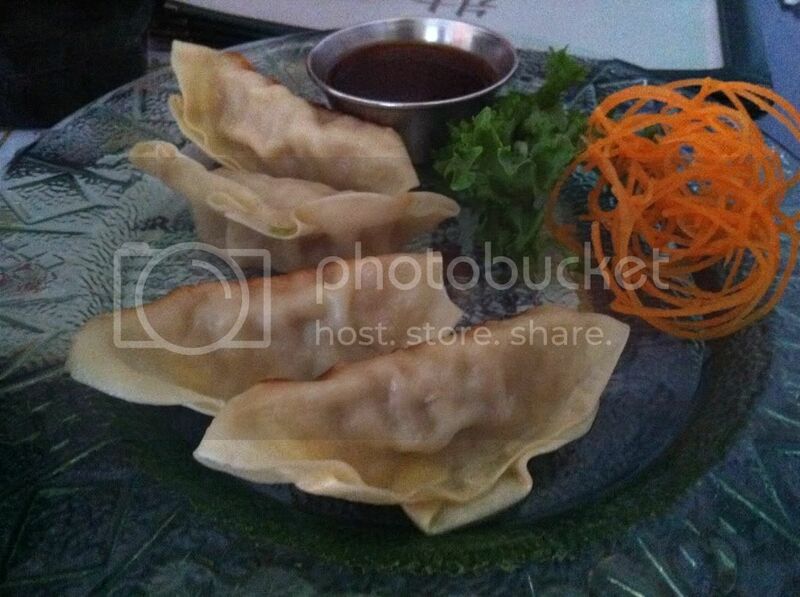 Gyoza as a whole, is a dish that is hard to do wrong; the dumplings themselves were alright and overall unimpressive. Unfortunately, the ponzu dipping sauce that accompanied them tasted just like regular soy sauce. This dish left us with a little to be desired, but we kept our gluttonous rampage going. Onto our next dish, Sushi Joe's Age Tofu. This dish boiled down to two large blocks of deep fried Tofu over a ginger/soy sauce. 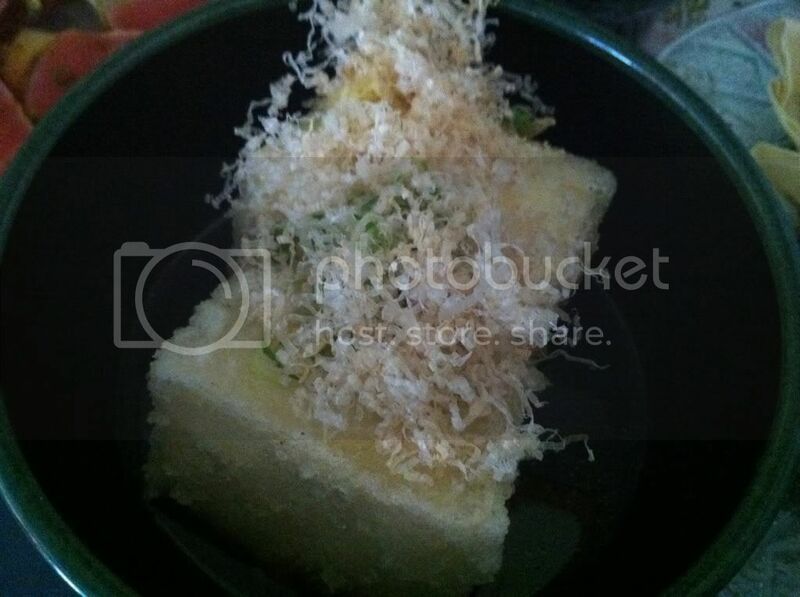 It was very tasty, but almost impossible to eat with chopsticks. The tofu was placed inside a small soup bowl and it was difficult to manage with my poor chopstick skills. When I was able to score a piece into my mouth, it was great. The Tofu wasn't hard (think the consistency of a cheese such as mozzarella) and had a tiny panko crunch around the edges that soaked up the ginger/soy sauce. The flavor of the dish was great and the fact that it was difficult to eat just made us want to eat it more. 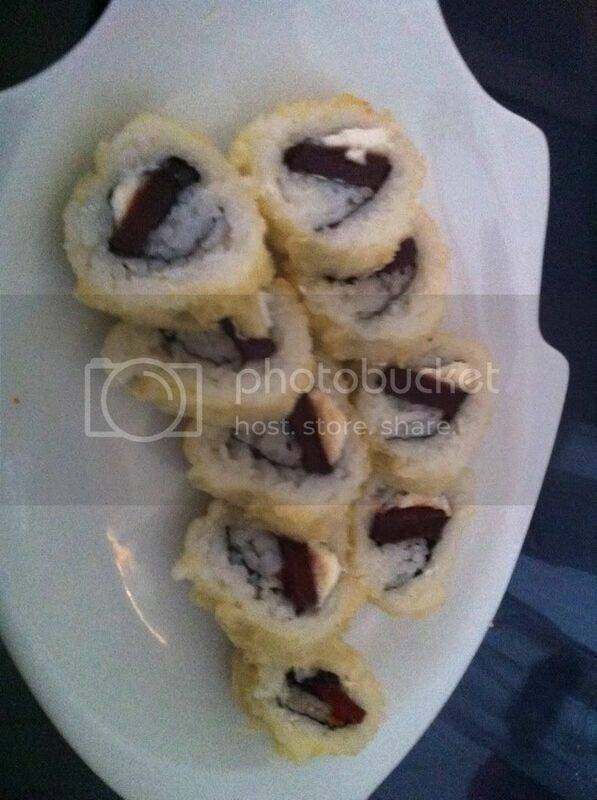 Once we waved our white flag on the Age Tofu, we moved along towards Sushi Joe's guava creamcheese tempura roll. My friends and I were all expecting a sweet cuban pastry in a roll, perhaps a dessert sushi roll and that's definitely not what we got. To our surprise, the roll was actually a savory and filling dish. The rice and the fact that the roll was fried actually took away from any over-powering guava sweetness we were expecting. 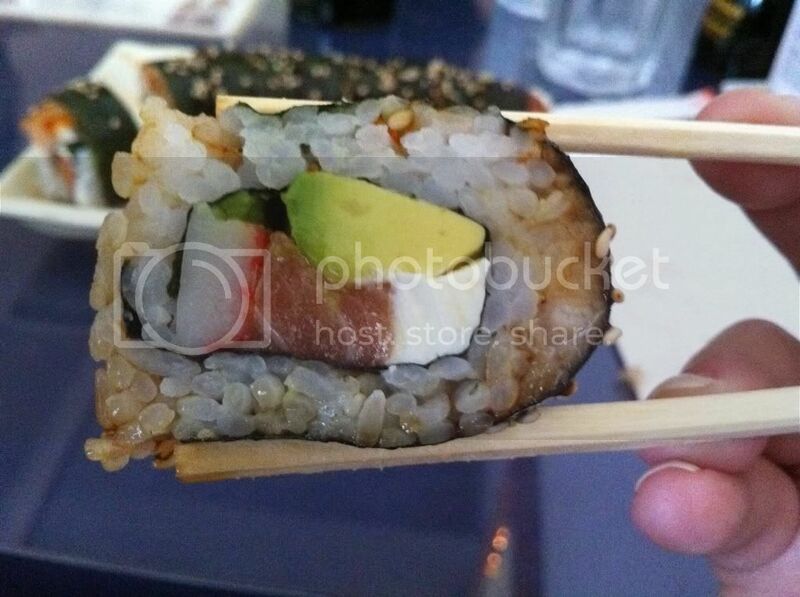 This dish is a good and different vegetarian sushi option. To be perfectly honest, by the time we were done eating all of these appetizers we were all completely stuffed. Did that stop any of us from ordering entrees? Absolutely NOT! We're fatasses from Miami, we don't know how to say 'No' to food. I'll go into detail about my entree only, since I didn't try the other girls' dishes. I went with their 'Blue Monster' roll which consists of salmon, crab, avocado, cream cheese rolled with eel and masago on top. The salmon and avocado were so fresh in this roll that they basically just melted in my mouth. This was also my first time trying eel in a roll (or anywhere else for that matter) and it was also really tasty and flavorful. 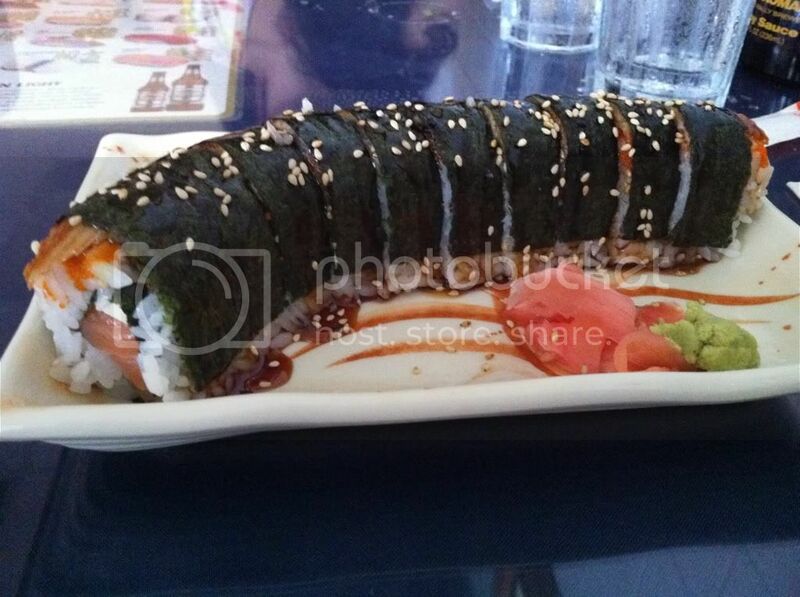 Although my body and stomach were completely full, I couldn't stop myself from eating the entire roll. It was delicious and I definitely plan to go back and try their Dorazuela roll (tempura sweet plantain and cream cheese) and their Cuban Roll (tempura shrimp, turkey ham, cream cheese with guava jelly). I love the fact that this restaurant is taking a stab at trying Cuban dishes and reinventing them into sushi. I think it's so creative and neat for them to try something like this in a community that isn't usually open to that kind of change with their food staples. Now if only this wonderful little hole in the wall could figure out a more eater-friendly way to serve the Age Tofu. Nice I love the blog. Loved it! We MUST go here when i make it back to the MIA. Thank you for the support <3 It means a lot!! Try the volcano roll!! It's seriously the best thing ever. Hopefully they haven't changed anything about it since I last had one, because it was perfect. Awesome blog Cari! You should go to Sushi Cafe,in front of the Mall of the Americas.Its excellent,try it one time and write something,you wont regret.